Today we are so excited to introduce to you our July Guest Designer: Gladys Marcelino! This talented lady always makes the CUTEST cards with the best coloring!!! I love her sweet style!! Hi Everyone! This is Gladys (instagram:crafty_m0chi) from Honolulu, Hawaii but recently moved to the east coast due to my husband's job transfer. We definitely miss Hawaii but both our families live there so it is comforting to know we will always have a place to stay when we visit. We have two kids 1 boy and 1 girl (ages 5 and 2). They are very active, smart, loving kids and they always keep me on my toes. We also have a fur baby, a dog named Molly who has been with us for almost 10 years now. We love having her around and we hope to have her with us for many more years. I have a full time and part time job so crafting is definitely my happy place from a busy hectic life. I have been crafting for a few years...started with scrapbooking but a year ago I fell in love with card making because it's a lot quicker for me to complete. Earlier this year I decided that it was time for me to share my love for cardmaking so I started posting my work on instagram. Thanks to social media I found a place where I can learn and be inspired. I have met so many talented people in the crafty community and I'm so grateful for the support and encouragement they have given me. So with that I would like to thank Vanessa for inviting me to be a guest designer on her blog! I'm so happy and excited to share my card with you today! For my card I used some recently release products from My Favorite Things. It is available here on the Butterfly Reflections Ink shop so get yours now before they go out of stock. I knew I wanted to make a birthday card theme so the Happy Birthday Centerpieces die-namics was perfect! The die come in one piece which I absolutely love because everything is lined up perfectly. You can make so many cards with just this one die! I decided I wanted to add a stamp image on my card panel so I cut the die off center, more towards the left. I then took another card panel and distressed it with MFT dye inks in coral crush, razzle berry and summer splash. 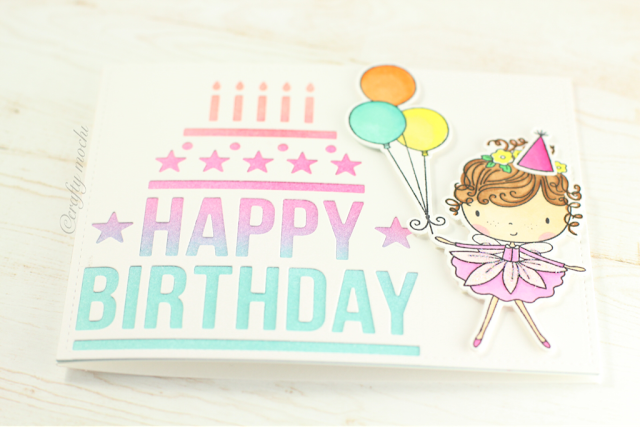 I stamp the balloons and hat from Beary Special Birthday stamp set and the girl image from Hello Beautiful. I colored them with copic markers and I added stickles on the girl's wings and dress. I adhered the two card panels together and used foam tape on the stamps to give it more dimension. That completes my card, I hope you enjoy and thanks again Vanessa for letting me share my project! Have a wonderful week everyone! What a happy card! Love it! !